BMW backed the German government’s goal to have 1 million electric cars by 2020 on the country’s roads, a week after Volkswagen said the target is achievable under broader terms for alternative drives. Carmakers are promoting electric-powered models to comply with tightening regulations that apply to their fleets’ emissions across the globe. Munich-based BMW, the world’s biggest maker of luxury vehicles, is putting the 34,950-euro ($48,200) all-electric i3 city car into showrooms in Germany next month. Volkswagen outlined plans in September to offer as many as 40 electric or hybrid models in the event that demand for low-emission cars takes off. The manufacturer will produce 14 vehicles with alternative drive through next year after introducing electric versions of the Golf hatchback and Up! city car at the Frankfurt auto show last month. VW also showed new plug-in hybrid versions of the Porsche brand’s Panamera four-door coupe and Audi’s A3 compact. Purely or partly battery-powered vehicles accounted for 4,157 new car registrations in Germany in 2012, about twice as many as the year before, according to the VDA auto-industry association. Germany’s new car market amounts to about 3 million vehicles a year. Volkswagen’s e-Up! went on sale in Germany this month for 26,900 euros. 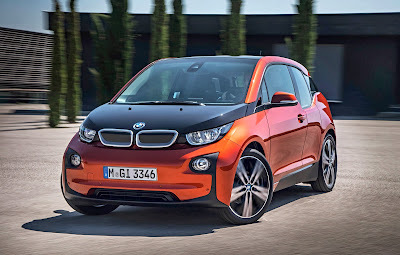 The model is “deliberately positioned” against BMW’s i3, Rudolf Krebs, head of electric-powertrain technology at VW, said on Sept. 4.